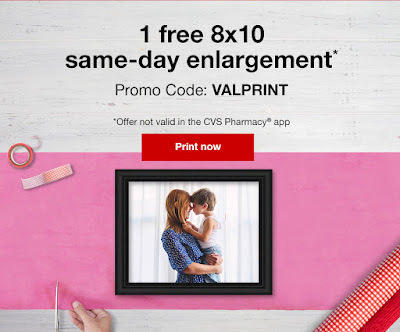 **OVER* Get 1 FREE 8x10 Same-Day Enlargement at CVS! For a LIMITED TIME ONLY!! Use promo code VALPRINT at online checkout and get an 8x10 print for FREE + FREE Same-Day Pickup! This would make a great Valentine's Day gift! *Add one (1) same-day 8x10 print to your cart and enter Promo Code VALPRINT to receive your one (1) same-day 8x10 print for free. 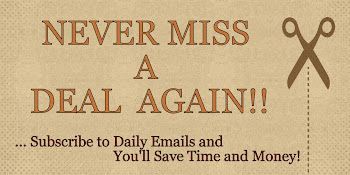 Offer excludes 4x6, 5x7, 6x6, 6x8, 8x8, wallet-size and all collage prints. Offer valid for same-day prints only. Offer valid online only. Offer starts 2/12/18 at 12:01 am ET. Offer ends 2/13/18 at 11:59 pm ET. Offer valid one time per customer. Promo Code must be entered at time of Checkout to apply discount. Savings are not transferable. Tax and shipping charges are not applicable towards the offer. Same-day pickup applies to select Photo products only (prints, select Photo cards, select calendars and select Photo books) on orders received by 7 pm local time.